Turcom makes some of the best drawing tablets around, letting you transform your computer into a canvas for hand drawings and other creative ideas. Their top-rated 10x6 tablet normally runs for $140, but io9 readers can grab one for just $49.99 + free shipping - over 60% off MSRP. 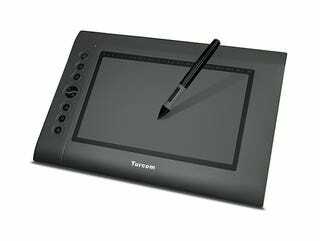 The Turcom Graphic Drawing Tablet & Stylus gives you everything you’d want in a drawing tablet - pressure sensitivity, precision, compatibility with most operating systems and programs, plus 24/7 customer support in case you run into any issues. At just $49.99 (64% off MSRP), it’s a great addition to your desktop set-up even if you’re not a professional graphic designer or artist. Shipping to the US is included in the sale price, and it should take 1-2 weeks to arrive. Unfortunately, this can’t ship outside of the US. Interested? Head to the link below to grab yours.